Learn about the Admiral of the Seven Seas! Met Agwe Tawoyo reigns over the sea. He is a Lwa from the Rada nation. He is an admiral in the Navy and is often depicted that way, or as a sailor. Agwe rules over all boats that sail on the sea. He rules some of the mysteries of the sea's depth, treasures, and gifts of the sea. He is the patron of fishermen. Agwe is seen as a very attractive light-skinned mulatto man having green eyes. His wives include the mermaid LaSirene and the coquettish Ezili Freda. One of his praise names is Koki la me (shell of the sea). Agwe is saluted and signaled by the blowing of a conch shell during his services. He can also receive gun salutes. He is kept moist, when in possession, with wet towels or sponges. Sometimes, Met Agwe sits in a chair using a cane as an oar, and this becomes his boat. A barque d'Agwe (boat of Agwe) is sometimes created, during big services to him, and filled with all his favorite foods, drinks, and gifts to him. It is placed in the sea and pushed off, if it sinks, Agwe has accepted the offering given to him and will fulfill the petitions made. His colors are white, blue, and see green. His Catholic saint is St. Ulrich. Make a clean space to set your altar. 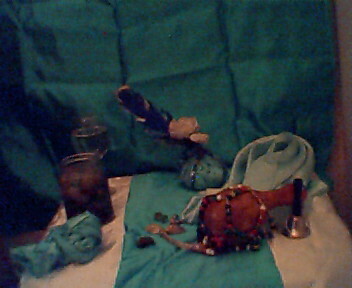 Cover the altar with a blue cloth and a place a big wine goblet of water in the center. On the back of the altar or pinned to the wall, or skirt of the altar cloth place a photo of St. Ulrich. The best day to serve Met Agwe is on Thursdsay, and if you can do it on that day so much the better. Take a spiritual bath, if you can, to invoke the power of the mighty sea and Met Agwe Tawoyo (if you need a spiritual bath for Met Agwe Tawoyo, email me at luxurious_08332@yahoo.com ) Dress in varying shades of blue and tie your head in blue or white. 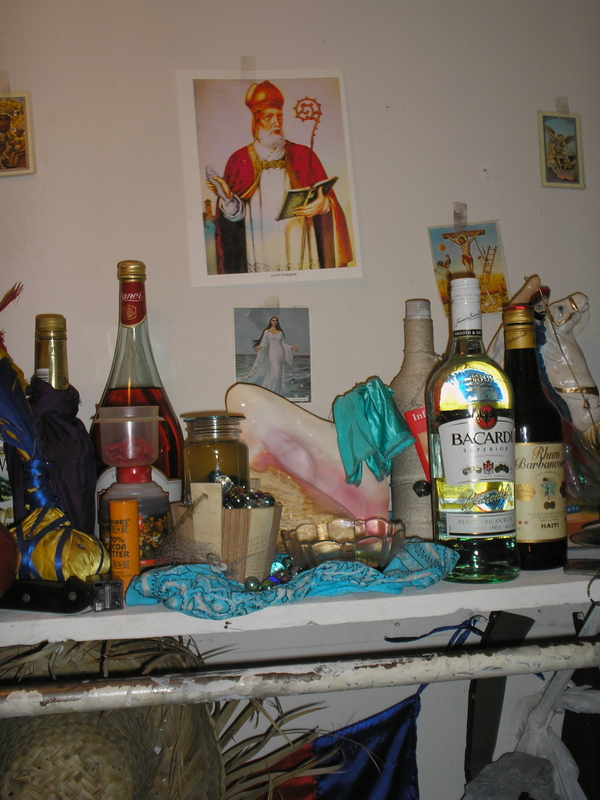 You can place pictures of the sea on his altar, along with photos of boats, seashells and a nice conch shell. champagne, anisette, white wine, and coffee with both sugar and cream. He can be offered cane syrup, melons, boiled cornmeal, rice cooked in coconut milk, fried ripe bananas, cake, white roosters, white ram goats, and ducks. As gifts he likes perfumes, mirrors, nautical medals, fish hooks, model boats, and rowing oars. Met Agwe! Met Agwe Tawoyo, Koki Lame. Come here for your service! Captain of the Seven Seas, husband of LaSirene, eternal Sailor, Seaman! Offer Agwe all the gifts you have for him. Orient them to the four directions, and the with the foods you have for him, place a white candle in the center before you orient them. Dance for Agwe and sing his songs. After you are finished, ask for that which you desire Met Agwe to do for you. Remind him, that you have just conducted a beautiful service for him and that now it is his turn to give you a service. Leave the room and allow the candles to burn out. Then dispose of all the food offerings in the sea, where Met Agwe can come and take them away.